Not enough shoegaze in your Sisters Of Mercy? Not enough um, brit-goth in your Bowie? 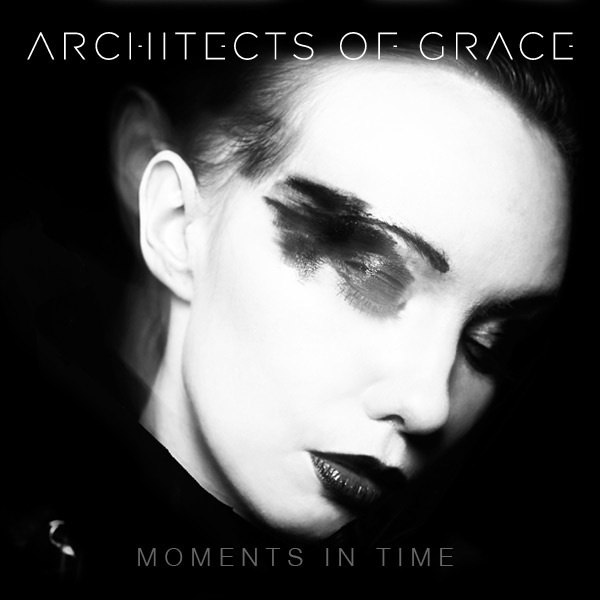 Well, what you need in your candlelit electro-rocker’s den in Architects Of Grace, and their beautifully-pitched debut album, ‘Moments In Time’. The whole thing unfurls with ‘Imperial’, a five-minute slab of atmosphere that brings to mind The Cure circa ‘Disintegration’ with its use of simple mesmeric riffs and reverb to caress the listener, and of course the mood is black as the night you were born. However the vocals are more a reedy Bowie-esque croon than Robert Smith, and the production and distorted guitar add more of a rock edge to the track. Continuing the heavy Cure vibe is the bittersweet melancholy of ‘Reflection’. If prog-tinged goth rock ever reached mainstream radio, the gossamer guitar melodies and hazy reverb-drenched vocals would be flowing from every other shop in the country. Worryingly accessible hooks reach out from the keening echoes and evocative instrumentation, and a catchy yet complex tone is held in the woven layers of backing vocals, muted percussion and sunny yet ghostly melody. This is chased up by the bass-driven thud of ‘Oceans of the Heart’, a desolate Jesus & Mary Chain/Gary Numan hybrid, with cavernous yet sparsely-arranged drum sounds, and reedy yet emotive vocals reaching the listener from what sounds like the other end of a long tunnel. The lilting guitar provides distorted treble, but the power of the arrangement is the throbbing bassline that drives the whole thing from limp to vital. The middle eight creeps up on the listener with a startling yet subtle disturbance in the hypnotic song structure, before sliding into a beautiful ending. A strong Peter Murphy vibe shows its colours (hinted earlier on ‘Not Necessarily So’, the heir of ‘Indigo Eyes’) on the stately edginess of ‘Damaged’, as nasal-voiced backing refrains counter smooth low-end instrumentation and luxurious main vocal line to create a disquieting yet lush post-punk track. ‘Tonight’ features a much heavier sound, particularly on the emphasised bass drum, which thuds like a heartbeat. The production feels much more intricate here, courtesy of Dave Allen, who knows exactly what to do given his work with not only The Cure, but Psychedelic Furs and The Chameleons, leading to a stellar matrimony of raw musicality and production expertise, all backed up by emotive lyricism. The heaviness continues on the stomping, rock-orientated twosome of ‘Heart Of It All’ and ‘Hot White Sun’, the closest the album gets to immediate viscerality in its pounding drum beat. The vocals and guitar remain hushed as ever, but Architects Of Grace’s unashamed post-punk sound ventures to punk in its sudden adoption of a loping bassline/snare-toms rhythm section, underpinning a paranoid, quietly squalling guitar tremble and vocals that border on angry in their subtle intensity. The latter ramps it up to the mood of a fever-dream, blending the band’s atmospheric leanings with industrial-toned distortion in guitars and electronics to create a Reznor-flavoured shoegaze track. The darkest moment is the Nine Inch Nails bleakness of ‘Insatiable’. Stripping away the haziness to reveal naked, reedy vocals with a surprising amount of impact, the key instrument here is a deeply distorted synth that is the sonic equivalent of staring into the abyss. Closure is bought about by the Gary Numan/Bauhaus hybrid ‘Midnight To Midnight’, an anguished slow-march through off-kilter melodies and placid melancholy. The almost childish 80s Casio keyboards inject a sense of nostalgia against the otherwise sophisticated instrumentation, and the vocals murmur a truly emotive poetic outporing. Given the recent trend for “dark indie”, I feel that Architects Of Grace could find a warm reception for their nocturnal cinematic rock. They wear their influences on their sleeves, but as ‘Moments In Time’ progresses, they bloom from a highly appealing Cure copy into a startling, subtle entity. This album may not grab so much as grow, but then again every gothic house needs its façade of creeping ivy, and here with have a perfect candidate to inject new life into the post-punk dark fascination.